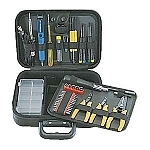 This 58-Piece Computer Tool Kit comes with a reverse ratchet handle that can be used with Square, Star, Slotted, Phillips, and standard or mm socket sets to fasten or remove screws from different computer components that need replacing or upgrading. IC extractor, 3-Claw Parts Retriever, and Reverse Action Tweezers can be utilized to remove processor chips and other internal computer components. Some parts on the computer like USB (Universal Serial Bus) ports are soldered on the motherboard so using the Solder Iron can help remove the device and replace with a new one by solder wick on the solder reel to securely attach new USB connector to motherboard. 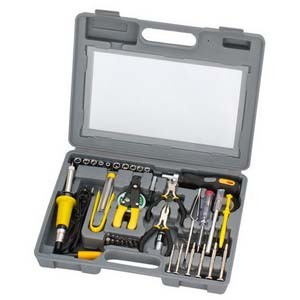 Test your power supply with the Electronic Voltage Tester to make sure your devices are getting enough current flowing through the electrical cables for proper performance and prevention of malfunction. 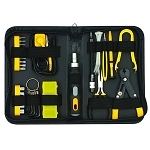 A flash light is included for visibility of small components in hard to see areas. 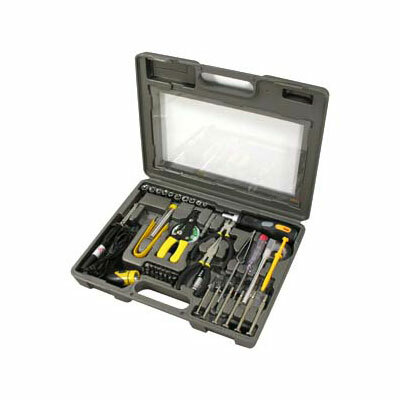 The hard case included with this tool set has a predetermined spot for all your tools so to prevent shifting when traveling and for identifying easily. 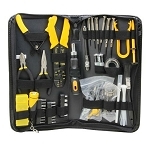 Having this 58-Piece Computer Tool set means having the power to fix any computer related problem quickly and effectively which is why the demand for this tool kit is so high.